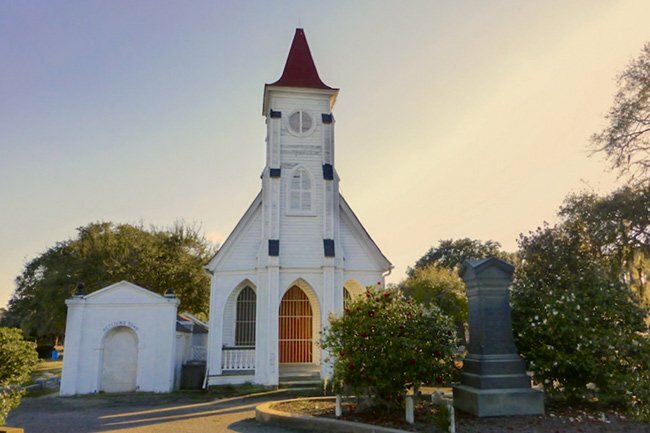 This chapel sits within the 55-acre Bethany Cemetery north of the Charleston peninsula and adjacent to historic Magnolia Cemetery. 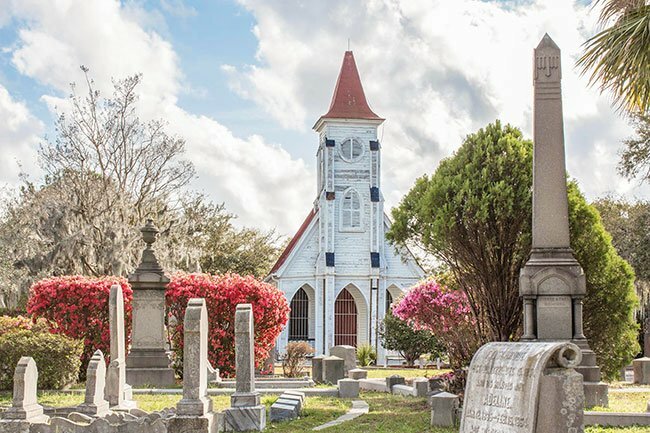 Owned and maintained by St. Matthew’s Evangelical Lutheran Church, the land was purchased by the church in 1856 when its first cemetery on Reid Street – called Hampstedt Cemetery – reached capacity during a yellow fever outbreak. Hampstedt Cemetery was sold at auction and divided into lots in the 1930s when assessments were not paid for a street paving project. 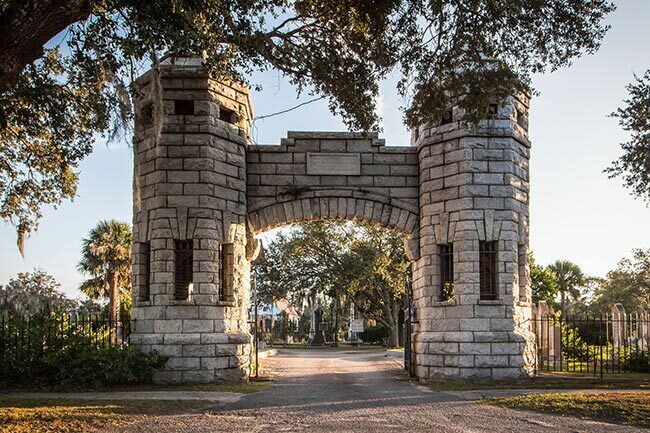 When the Charleston Housing Authority purchased the Hampstedt Cemetery property in 1981, the department had no idea the land contained human remains. After it begun site-preparation work, the graves were discovered, and the Housing Authority relocated 437 graves to Bethany Cemetery in 2009. 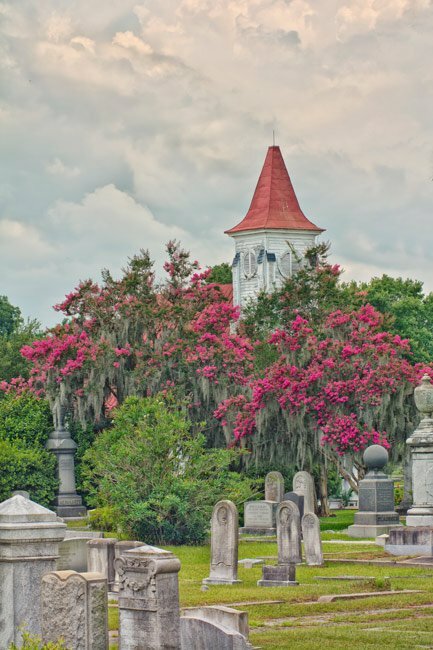 Though Bethany Cemetery is affiliated with the Lutheran congregation, people of all denominations are interred at the cemetery. 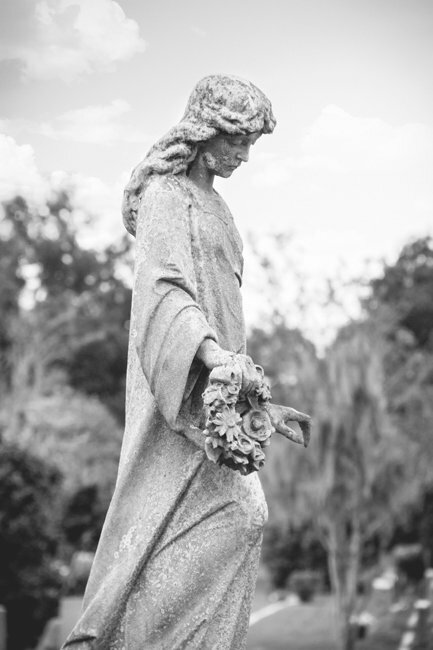 The cemetery is known for its Victorian-era funerary art, as seen on its headstones and monuments. The receiving tomb, seen above and below, stands close to the chapel at Bethany. 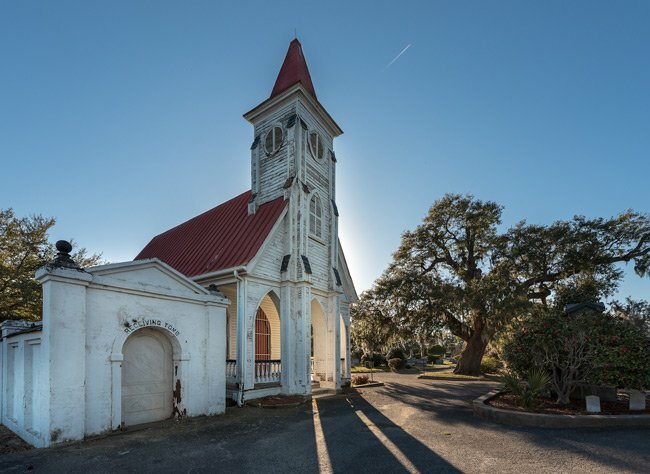 Many historic cemeteries had these, but rarely are they still intact. 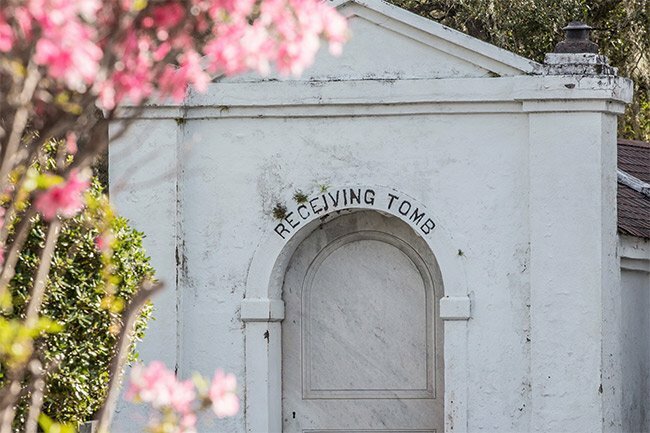 Before the days of refrigerated storage, deceased people were stored in these masonry tombs while their burial plot was prepared and families gathered. The materials used to build these structures promoted a cooler environment in which the decomposition process would in theory slow until the body could be properly interred. 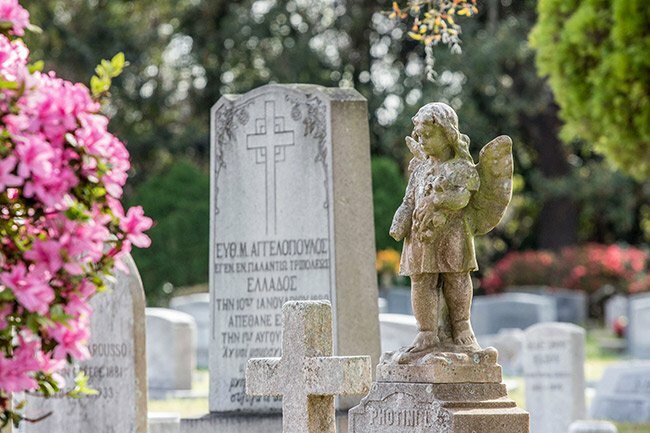 We are not directly affiliated with the cemetery but do visit fairly often. Do you know where they are buried within the grounds? There are a lot of camellias that we have noticed there still. My parents are buried here. Clyde Hamilton Walters and Lucille. He died 1954. I planted a cameilla bush back then. Is it still there? It is in perpetual care. I am unable to visit. Thanks. Hello Donna, we searched the website, Find a Grave, for a memorial for Mary Daniels McCoy Ice with no results, we changed it to just Mary Daniels McCoy and still nothing. This doesn’t mean that she isn’t there as Find a Grave is volunteer ran and it could be that it has not been completely documented yet. 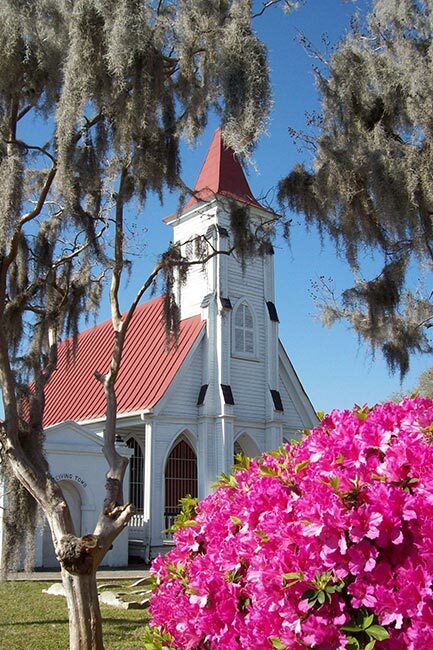 We recommend reaching out to Bethany directly, they have ways to see who is buried in the cemetery and where their plot may be. If needed, I (Brandon Coffey), would gladly take a photo for you if you find out where it is and couldn’t get here. I live in the Charleston area. My email is brandon@sciway.net. Bethany’s phone number is (843) 723-3121. I have been searching for the grave of my Great Grandmother, who according to her death certificate is buried in Bethany Cemetery. She died in Roper Hospital 12/19/1925 and was buried 12/22/1925. Her name was Mary Daniels McCoy Ice. Would you have any information or be able to at least point me in the right direction? I would so appreciate any help you could give me. I live in Kansas and trying to find things back east is hard especially when I’m new to this.